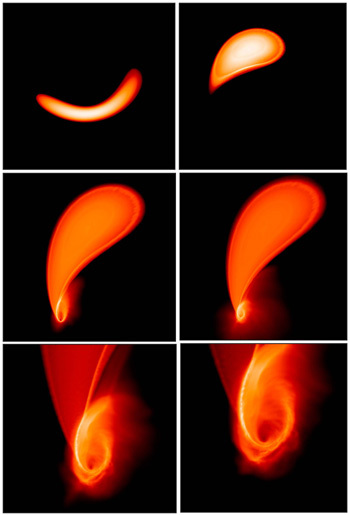 This series of images shows the interaction of a white dwarf star with a black hole. As it passes the black hole, the white dwarf becomes strongly compressed and heated (top left), triggering an explosion. Most of the stellar mass is ejected into space (the "bubble" in the upper right part of the debris in the top right image), while the rest (the cusp-like part of the image) falls toward the black hole. While the ejected matter expands rapidly, the infalling matter builds a violent, thick accretion disk around the black hole. A strange and violent fate awaits a white dwarf star that wanders too close to a moderately massive black hole. According to a new study, the black hole's gravitational pull on the white dwarf would cause tidal forces sufficient to disrupt the stellar remnant and reignite nuclear burning in it, giving rise to a supernova explosion with an unusual appearance. Observations of such supernovae could confirm the existence of intermediate-mass black holes, currently the subject of much debate among astronomers. "Our supercomputer simulations show a peculiar supernova that would be a unique signature of an intermediate-mass black hole," said Enrico Ramirez-Ruiz, assistant professor of astronomy and astrophysics at the University of California, Santa Cruz. Ramirez-Ruiz and his collaborators--Stephan Rosswog of Jacobs University in Bremen, Germany, and William Hix of Oak Ridge National Laboratory--used detailed computer simulations to follow the entire process of tidal disruption of a white dwarf by a black hole. Their simulations included gas dynamics, gravity, and nuclear physics, requiring weeks of computer time to simulate events that would take place in a fraction of a second. A paper describing their results has been accepted for publication in Astrophysical Journal Letters, and a preprint is currently available online. "Every star that is not too massive ends up as a white dwarf, so they are very common. We were interested in whether tidal disruption can bring this stellar corpse to life again," said Rosswog, the first author of the paper. A white dwarf can explode as a "type Ia" supernova if it accumulates enough mass by siphoning matter away from a companion star. When it reaches a critical mass (about 1.4 times the mass of the Sun), the white dwarf collapses and explodes. Astronomers use these type Ia supernovae as "standard candles" for cosmic distance measurements because their brightness evolves over time in a predictable manner. The new paper describes a distinctly different mechanism for igniting a white dwarf, in which tidal disruption by a black hole causes drastic compression of the stellar material. The white dwarf is flattened into a pancake shape aligned in the plane of its orbit around the black hole. As each section of the star is squeezed through a point of maximum compression, the extreme pressure causes a sharp increase in temperatures, which triggers explosive burning. The explosion ejects more than half of the debris from the disrupted star, while the rest of the stellar material falls into the black hole. The infalling material forms a luminous accretion disk that emits x-rays and should be detectable by the Chandra X-ray Observatory, the researchers said. "This is a new mechanism for ignition of a white dwarf that results in a very different type of supernova than the standard type Ia, and it is followed by an x-ray source," Ramirez-Ruiz said. He estimated that this type of event would occur about 100 times less frequently than the standard type Ia supernovae, but should be detectable by future surveys designed to observe large numbers of supernovae. The Large Synoptic Survey Telescope (LSST), planned for completion in 2013, is expected to discover hundreds of thousands of type Ia supernovae per year. "These exotic creatures will start showing up in the data from the LSST," Ramirez-Ruiz said. "We want to predict the light curves so we can look for them in the survey data." The mechanism described in the paper requires a black hole that is neither too small nor too big. Such intermediate-mass black holes (500 to 1,000 times the mass of the Sun) may reside in some globular star clusters, but there is much less evidence for their existence than there is for the relatively small stellar black holes (tens of times the mass of the Sun) or for supermassive black holes (a few million times the mass of the Sun), found at the centers of galaxies. The new paper describes in detail the disruption of a white dwarf with two-tenths the mass of the Sun by a black hole 1,000 times the mass of the Sun. The researchers also found that they can vary the mass of the white dwarf and still get the same outcome--tidal disruption and ignition of the white dwarf. "We can ignite the whole mass range of white dwarfs if they get close enough to the black hole," Rosswog said. This research was supported by the Department of Energy's Program for Scientific Discovery through Advanced Computing. Note to reporters: You may contact Ramirez-Ruiz at (831) 459-3400 or enrico@ucolick.org.